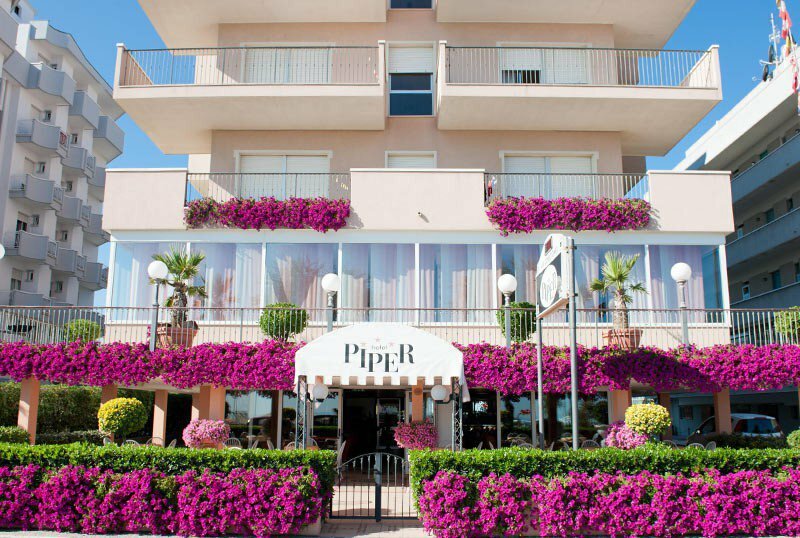 Hotel Piper , a 3-star hotel on the family-owned Torre Pedrera seafront, welcomes guests in a simple and informal setting. It has secure parking, free bicycles, WI-FI connection and services for children. Small and medium-sized pets allowed. The hotel overlooks the seafront of Torre Pedrera, a quiet hamlet of north Rimini. To reach the beach, simply cross the promenade. The rooms have a balcony overlooking the sea, air conditioning, WI-FI, satellite TV, telephone, safe, private bathroom with shower, curtain or bathtub, minibar on request. Garden, terrace, free use of bicycles (limited availability), large lounge, bar open 24 hours a night, dancing evenings weekly. PARKING: uncovered available to all customers, covered available while seats last, both free. AIR CONDITIONING: present in both common areas and rooms without additional costs. CONVENTIONS: beach, amusement parks. On request: shuttle service and organized excursions. PETS: small and medium-sized guests both in the hotel and on the beah affiliated with the hotel. BREAKFAST: sweet and savory buffet with yogurt, cereals, jams, muesli, homemade cakes, meats, cheeses, eggs. LUNCH AND DINNER: in the panoramic dining room overlooking the sea are served menus with 3 choices with fish every day, followed by a buffet of vegetables and appetizers. Every evening there is a double course of first courses with a dry pasta and a soup. Pasta and desserts are homemade. In the hotel: strollers, bicycle seats. On request: baby sitter service and pediatric counseling. In the room: cots, cribs. At meals: kitchenette for mothers, fresh vegetable broths, high chairs. The hotel has an agreement with Bagno Enrico n. 75 and Kamoke Beach n. 76. The Bath n. 75 offers playground area, dog area, playgrounds, nursery, canoe and pedal boat rental. The Bath n. 76 has a mini club, entertainment, playground, nursery, disabled facilities and canoe and pedal boat rental. Prices in full board and half board are per person per day for a min. Three days. All-inclusive prices are per person per day for a min. 7 days. TOURIST TAX: excluded. € 1.50 per person per day for a maximum of 7 consecutive nights, excluding children under 14 years. - The booking of the room will be confirmed upon payment of a deposit of € 200.00. - In case of late arrival or early departure, the cost of the accommodation will be charged. For stays from 02nd to 22nd June, 1 child in a room with 2 adults is FREE!